So much so that NO will almost qualify as a reflex action at this point. D : Hey Mom, Can I..? At the time, I just attributed it to being busy, and not having the time or the energy to deal with it. But, some months back, I made a conscious decision to cut down the negative reinforcements and increase the positive ones. I decided to read up on it, and in the process gained an interesting insight from an article by a child psychologist, which I want to share. The article that I came across discussed how true encouraging words focus on the deed as much as the doer. This is important to build confidence, and motivate a child from the inside to demonstrate similar positive behavior in the future. Look at your improvement. You really did a good job! Thanks for helping me clean up. Such a good boy! That was a tough one, but you figured it out. Proud of you! *The concept was discussed in the article, but the examples are my own. They are based on what I use on a daily basis. So it is just my interpretation of the idea. Please do let me know if you have any additional insights. Parenting, at its best is a work-in-progress. Hence all comments/suggestions are welcome and very much appreciated. Totally agree with it. Positivity reinforces positivity. Parenting is such a great unlearning experience, sane advice. Agree Shantala…In fact , it is said when we caution a child the chances of him/her messing up is more. For instance, if a toddler volunteers to keep a glass of water on the table, and we say, ‘oh be careful’; ‘walk slow’…. Our words will sure distract them and and affect their confidence. And 8 out of 10 they will drop the glass. Else they pretty make it! I agree with you, positive reinforcement rather than punishment works wonders on children. My son went through a stage of eating poorly, Rather than yelling at him, each time he ate well he got a sticker and each time he filled up a page of stickers he got to spend $5 on a toy. After a while eating well and good food became a habit. Good post. My parents have always been encouraging and supporting. A reason why my siblings and I grew up confident. As I read your post, I could see how words could leave a permanent impact on children. Children emulate us and are always watching 🙂 Positive responses make them feel good and they strive to do better. Its a great post. Let me put it to more practical use for my children. This is a very useful post. 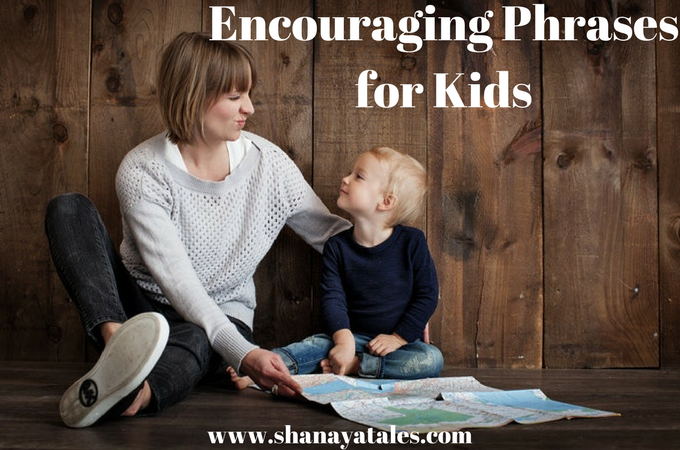 Small kids are so enthusiastic to learn new things and a few words of encouragement, can help boost their morale. Yes. It’s always nice to be positive. It leaves its mark on the child too. Nice thoughts! Specific praise is so very important. And focusing on effort than outcome. It’s so easy to yell and put down but so much harder to build kids up. Neither a parent, nor ready to be one as of now Shanaya :P, but your post was truly interesting.. So true! And they say, name your child a name YOU really like. Because you’re going to be shouting it. A lot!! Positive reinforcement, in many cases, works wonders. We all use negativity so much that we forget! I always make a point to use good manners with my children even when they were very little. Thanking them, saying please and now that they are adults they use those manners all the time. But all parents have days when we seem to say no all the time. Seriously, the more “No” and negative we speak, the more negativity we fill in our lives! Who doesn’t like to be praised I say.. a pat on the back and the miracle follows 😉 Loved reading your replies and the change! Sorry, I posted the link Elizabeth’s blog. She’s a great blogger you can visit though. There’s an expression, always catch a child in doing good. Especially children who manage to get into trouble, need to have the positive things they do praised. No one can survive a diet of only “no” without being stunted. Positive reinforcement is so important for children! Your image at the top makes it clear. Such a great advice! Encouraging words during childhood can affect the overall development so much, especially in terms of stress handling and relationships. Great turnaround for speaking to children. It is so important to have a positive vocabulary and I love how you talk about encouraging from the action. I can relate with this post completely as I’ve a small kiddo who’ll do everything tht she is not supposed to. So mostly my vocab also has only “NOs” for her. But yes even I try to encourage her when she does something nice by clapping or cheering her. I don’t have kids but I’ve seen how well positive reinforcement works with adults in my training sessions, Shantala. I have always conversed with my kids like they were equals…miniature adults. Which is probably why they have big vocabularies and are more mature than their years.